You are visiting: Home » Healthy Living » Essential Oils » I tried. For years, I have tried. I told myself that it was crazy. I told myself that it was a scam. I told myself that it was just a trend that would be gone just as soon as it became popular. I tried and I fought and I pushed back just as hard as I could to not believe in the power of Young Living essential oils. I tried. And I failed. I can no longer deny what these wonderful oils and oil-infused products are doing for me and my family. I find myself reaching for them when I have a mosquito bite, when I wake up in the middle of the night and cannot fall back to sleep, when my kids have chapped lips. I use them to relieve headaches, stuffy noses, and sore muscles. I use them to clean our house and wash our fruits and vegetables. In true Makely fashion, I believe that Young Living essential oils and products are making my home (and those of us in it) more awesome. I have wanted to talk to you about these oils for some time (I did briefly here and here), but I kept stopping myself. I kept thinking, “Oh, they don’t really care about that.” Or, “What if they think I’m nuts?” But then I realized that if you’ve stuck around all this time, you probably do care and you definitely already know that I’m nuts. So, here we go. My friend Myra got me hooked on Young Living when we shared a room at a blogging conference about 2 1/2 years ago. She had checked in before me, and our room already smelled like a spa when I walked in – she was diffusing the Thieves blend to purify the air and help support her immune system. It was love at first sniff for me, even before I understood the wellness benefits of using essential oils. I bought a starter kit when I got home from that conference, and I started out just using the oils for basic things – to help make my house smell better, to help get relief from my mold and cedar allergies, and to help relax me so that I get better sleep. Then, I got into the Thieves all-purpose cleaner so that I could use an all-natural cleaner at home. And now, I’m using protein powders and the kids and I are drinking the NingXia Red whole body supplement. It really may be a mind over matter situation, but dang – I feel GREAT these days and I want to share it with the world! I use Young Living because of the Seed to Seal promise. These products are genuine and without synthetics. The company carefully monitors every aspect of essential oil production – literally from the each plant seed to each bottle’s seal – so that it can produce essential oils with unmatched purity. I feel confident using them for myself and my family. 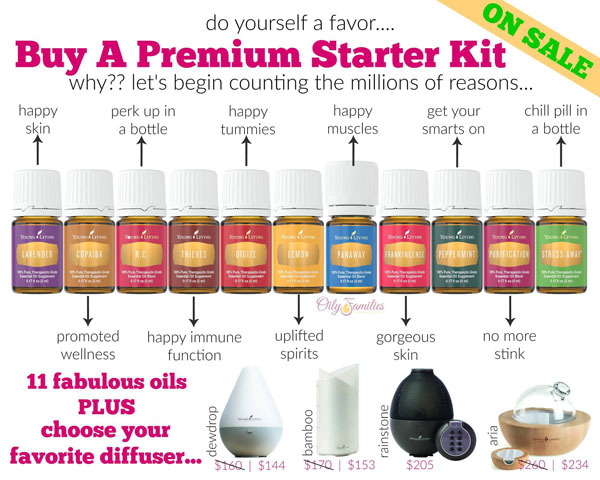 Purchasing a Premium Starter Kit also gives you the ability to become a Young Living distributor and build a business, although it’s certainly not a requirement. I personally just enjoyed my starter kit and other Young Living products for years before I made the decision to begin sharing the products with my friends. But if you are looking for a way to make your family’s budget easier to meet or save up some fun money for a vacation (or pay off your mortgage or possibly replace an income), this is a great way to go about it. If you have any questions at all, please let me know! You can leave a comment or email me at Lindsay@MakelyHome.com. Or if you are ready to get started using Young Living essential oils in your home, you can sign up here. P.S. I can’t wait to share with you EVERYTHING that’s been happening in my life over the last few months. Things have been quiet on the blog, but they’ve been moving and shaking behind the scenes. More to come very soon! I want to become a Young Living distributor and build my business. Very interesting!